There are mirrors in my bathroom, but I don’t often look in them. One morning after bathing, for some reason, I looked in that direction and noticed a rash on my side, just below the waist. I’m not prone to skin eruptions. Two of my close friends had just gone through the horror of dealing with bedbugs. They each, separately, described in agonizing detail, what they had to do. One ended up staying at a hotel until her crisis was over, and both were exhausted by the horrendous task of getting all possessions properly laundered, cleaned, and bedbug-free. One had not even seen a bedbug at first. Noticing a rash on her body, she had twice visited her doctor, who had no idea what the cause was. In the end, a pest control company discovered the reason — bedbugs! They were also constantly talking about bedbugs in the media. On radio they warned you could bring them home from theaters and libraries. I go to theaters. I constantly take books out of libraries. On TV, they showed pictures of the bugs and talked about the difficulty of getting rid of them now that some pesticides used in the past are banned. My friends had bedbugs. Lots of people had bedbugs…..I’ve got a rash. I must have them too! It was late evening when I came to that conclusion. No matter. I stripped my bed, put all my bedding into the dryer — on high, and vacuumed my mattress even if it would disturb others. (I’m usually a more considerate neighbor.) I chose a full-length nightgown with long sleeves, wrapped myself up like a burrito, and didn’t sleep all night. The next morning, I called our building’s pest control service, but I was not authorized to do so. I desperately tried to reach our caretaker, who didn’t answer all day. Darn….. I couldn’t bear the thought of getting into my own bed, so I moved to the bed in my guest room, where I again tossed and turned all night. Finally, the next day I got to talk with the pest control company. No one else in our building had reported bedbugs. Nonetheless, I gave them my tale of woe and reported what I had done. “Well, if you do have bedbugs, you’ve probably destroyed all the evidence,” said the voice on the phone. Oh, dear! They would send someone the next day. Another sleepless night. He was a quiet, patient man. He moved to the next room and checked my guest bed. “You don’t have bedbugs!” He announced positively. The guest bed looked like a hurricane hit it. Maybe he wasn’t that patient after all. Still….I wasn’t giving up so easily. The poor guy dutifully followed me outside. He pulled out the contents of the vacuum cleaner bag and started going through it. “Then what is this?” I queried desperately, tugging my slacks down at the waist and exposing my rash. Anyone else would have fled as quickly as his feet could carry him. Not this guy. He was made of steel. He didn’t even get angry. Nor did he seem surprised at my audacity. Cool as anything, he stood there and studied my rash. How could he be so sure? “99.99%” doesn’t mean “absolutely”, does it? Just in case after 39 years he was still wrong, I again threw all my bedding back into the, by now, exhausted dryer. I, exhausted as well, climbed into my own bed for another sleepless night. How long can one survive without sleep? My children deserve medals. They put up with me. They also continue to love me in spite of everything. 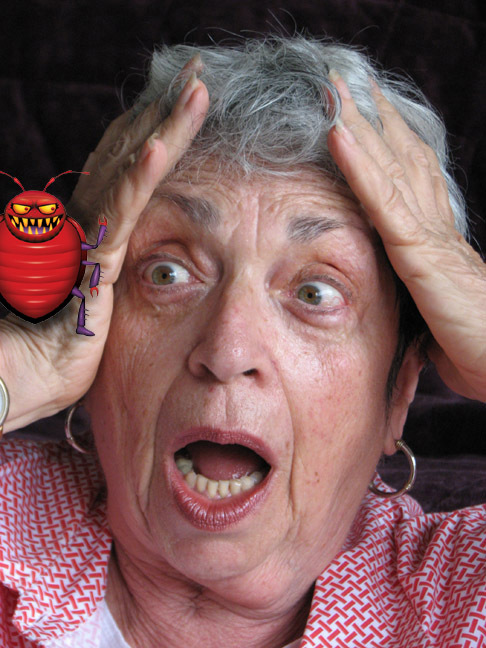 Talking to my son that night, I reported on the newest events in my bedbug saga. I mentioned the new medication for arthritis pain I was taking, and that I would find out if it could be responsible for my rash. My son doesn’t waste time. He checked the internet during our conversation and confirmed that, yes, the rash could, indeed, be from the medication. That’s how my poor doctor got involved. I love my doctor. She puts up with me too. She has also seen me through some really rough times. This was one of the times where she had to put up with some of my craziness. Remember, I hadn’t slept for nights. I couldn’t think straight. She suggested it could have been a mild case of shingles, that I not dispose of the arthritis pain medication just yet, (it had cost me over $100) and to go home and try to rest. I didn’t agree. I had had a shot to prevent shingles, she couldn’t be right. I managed to sleep that night — but not until I had again carefully inspected my bed. After only one night’s decent sleep, I was able to recall that I was told that even with the shot for shingles, you could get it, but it would be mild. My doctor may have been right after all. I never did have bedbugs, but it took a really long time for me to recover from this episode. Even now, about a year later, it is still painful to remember.